Review by AllTheBestFights.com: 2015-07-11, tremendous exchanges in the second part of the fight but the first part was not so exciting: Robbie Lawler vs Rory MacDonald 2 gets three stars (UFC Fight of the Night). Robbie Lawler entered this fight with a pro mma record of 25-10-0 (80% finishing rate) and he is ranked as the No.1 welterweight in the world. He fought four times last year losing to Johny Hendricks (=Hendricks vs Lawler) but then he won three consecutive bouts beating Jake Ellenberger (=Lawler vs Ellenberger), Matt Brown (=Lawler vs Brown) and taking revenge on Hendricks (in a fight valid for the Ufc Ww belt Hendricks vs Lawler 2). His opponent, the black belt in no-gi Brazilian jiu-jitsuRory MacDonald, has an official record of 18-2-0 (72% finishing rate) and he entered as the No.3 in the same weight class. He suffered his last loss in 2013 when he faced for the first time Robbie Lawler (via split decision MacDonald vs Lawler), after this bout he has won three bouts beating Tarec Saffiedine in his last one (=MacDonald vs Saffiedine). 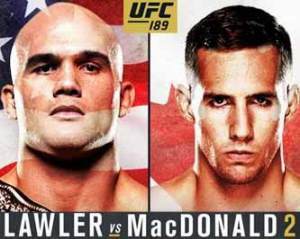 Lawler vs MacDonald 2 is valid for the Ufc welterweight title (Lawler’s first defense); undercard of Chad Mendes vs Conor McGregor – UFC 189. Watch the video and rate this fight!